Brian “Head” Welch and Korn have added a number of fall tour dates commemorating the release of their landmark self-titled 1994 debut album. Named the “most important metal record of the last 20 years” by Rolling Stone, Korn inspired an entire generation of nu-metal rock outfits. The band plans to perform the album in its entirety on this tour, so be sure to catch it while you can! 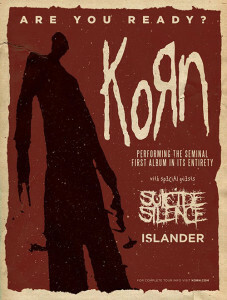 Suicide Silence and Islander will be featured as supporting acts on the tour. Check out the dates and link to purchase pre-sale tickets below!